For the casual sports bettor who wants to get his or her feet wet, there are some great sportsbooks worth checking out, but BetOWI isn’t built for you. Yes, those new to the sports betting world will be comfortable at BetOWI, with friendly customer support and an easy-to-navigate betting portal. But this popular online sportsbook was designed for the serious sports bettor, the kind of betting fan who is passionate about sports. The kind of sports bettor who demands the best lines and knows about shopping around. The kind of sports bettor who wants to get everything done quickly and in one place. If that sounds like you, BetOWI might be your best bet. Read on to see what we have to see about this Costa Rica-based wagering site. 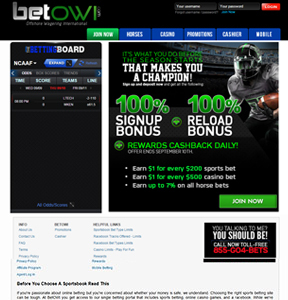 BetOWI is a bettor’s fantasy come true. In addition to a comprehensive sportsbook, the sports betting website also offers a full-service racebook so you can bet on horses. The racebook boasts tracks from around the world, so there’s always an opportunity to place a wager. There’s also a full casino. Actually, make that three casinos, including Fortunate Casino, Casa Blanca Casino, and a mobile casino. And speaking of mobile, we absolutely love BetOWI’s mobile betting platform. Gone are the days when you need to be at your Mac or PC to place a bet. BetOWI understands that things in the sports world change on a dime, so they’ve developed an excellent mobile betting app that works on iPhone’s, Androids, and even BlackBerry devices. While we like the fact that you’ll earn $1 for every $200 bet on sports and $1 for every $5 casino bet, these values aren’t accumulative, so you need to place that bet daily. That said, the offer is far more generous than what we’ve seen elsewhere. There are countless online sportsbooks operating and we give you the credible information to make informed decision where to play. The books we list on our website have all been approved and endorsed based on our own analysis as well as feedback we receive from our site visitors. The review of these sportsbooks is an ongoing process and the criteria we use to formulate the overall rating of each sportsbooks was chosen by the editor as well as feedback we received from the loyal community we have built. The criteria is broken down into 5 major categories which include Customer Service, Deposit Methods, Payout Methods, Software and Customer Feedback. Within each of those main categories are sub-categories such as chat response time, credit card approval rate, payout processing time, mobile betting platform and website up-time to name a few. We analyze the results of all of our criteria as well as the customer feedback from trusted community members and we issue a final overall rating score. The rating score can remain the same or change over time if a endorsed sportsbook fails to live up to their expectations.